A superlative-laden title suggests something that’s on-the-nose sentimental, satire, or subversive irony. 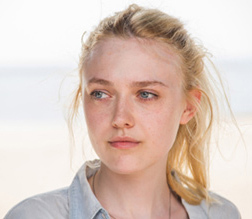 Very Good Girls is none of those things, and isn’t much of anything. A full quarter-century after penning the Oscar-nominated screenplay for Running on Empty, first-time director Naomi Foner (working from her own script) fails to find any substance in this unimaginative coming of age tale. Her clinical approach to the derivative story of two female friends falling for the same bland hunk adds a sense of detachment that makes all the folly that much more transparent. New high school grads Lilly (Dakota Fanning) and Gerry (Elizabeth Olsen) open their summer by streaking across Brighton Beach for no other reason than to establish Gerry as the more free-spirited yin to Lilly’s cautious yang. While leaving the beach (clothed), the pair crosses paths with ice cream vendor/photographer David (Boyd Holbrook). Gerry is inexplicably drawn to his cold disposition, but he’s immediately taken with Lilly. Looking to cement this summer as a rite of passage before Lilly heads off to Yale, the girls make an impromptu pact to lose their virginity. Gerry is hopeful of her prospects with David, but he chooses to woo Lilly with a trail of photos pasted around the neighborhood and a few choice lines of Sylvia Plath. After Lilly is deflowered in her parent’s garage, she continues to hide her romantic relationship from her bestie, who still pines for the guy. Gerry suffers a sudden, painful loss (just in time for a convenient plot contrivance), and Lilly urges David to console her. What may or may not happen next puts the girls’ bond to the test. Fanning and Olsen are talented actresses, but are hamstrung by the dippy material. Fanning is forced into curious character traits to fit the scene at hand – from deriding dad to confiding in him, or from Yale-bound scholar to putty in the hands of dull David. Olsen is five years older than Fanning and looks it, undercutting Gerry’s more whimsical lean. The biggest sin is expecting us to believe that either one of these girls would fall for David, whom Holbrook fails to infuse with even the slightest hint of personality. That he’s the crux of this friendship crossroads is a slight to all involved. It’s confounding that a female writer-director, who’s also the mother of actress Maggie Gyllenhaal, would give her leads such skeletal attributes to work with. Ancillary entanglements are handled just as badly, including a subplot involving Lilly’s boss (Peter Sarsgaard, Foner’s son-in-law) making inappropriate, not-so-subtle advances. His purpose isn’t to add color to Lilly’s experiences, but to be part of some third-act minutiae before kept secrets are revealed. Secrets are treated with such reverence, yet are so trivial they’re nothing that can’t be overcome by a good chuckle and a therapeutic skip through a lawn sprinkler.